January 24, 2019 – Medals are very special historical witnesses. On an incredibly small space, they give proof of how rulers wanted their story and history to be seen. Every medal emphasizes the tides of its time. It says: this moment, the one I will preserve for eternity, is particularly important for us and for posterity. Medals are a kind of numismatic exclamation point. Even though we interpret certain historical instances differently today, the pieces can still tell us a lot about their creators’ understanding of history. Joachim Zeitz, Badische Medaillen. Schaumünzen dokumentieren dreihundert Jahre oberrheinische Geschichte bis 1806. Michael Imhof Verlag, Petersberg 2018. 603 pp., fully illustrated in color. Hardcover. 24.7 x 32 cm. ISBN: 978-3-7319-0400-7,99 euros. The fact that medals are also pieces of art that outshine coins by far in terms of complexity, originality, and artisanal craftsmanship is disregarded by many. Those who are interested in medals are all the more appreciative. The lack of popular interest is the reason why the pieces are generally sold at too low a price considering how impressive they are. Books like this one might change this fact. Joachim Zeitz’s monumental work whets the reader’s appetite to start collecting medals. Today, Baden is a part of the German state of Baden-Württemberg. Until the beginning of the 19th century, it was a fragmented region of very small or even tiny dominions. Joachim Zeitz attempts to sort this fragmented region. He lists places, dominions, and geographical terms alphabetically and numbers the respective medals consecutively. In a second, much shorter chapter, he catalogs, in cooperation with Stefan Fassbinder, the medals made for and by pilgrimages and brotherhoods. First things first: medals usually can’t be classified as easily as coins. There are numerous pieces in this book that allow for a discussion about whether or not they actually belong to Baden. One fitting example is a gorgeous medal which was minted by the Monnaie de Paris in celebration of the alliance of Louis XVI and the prince-bishop of Basel. Can this piece really be associated with Baden? Of course, the bishopric of Basel owned territories which are considered part of Baden today, namely the bailiwick of Schliengen. Does this allow for a classification of the medals of the prince-bishops of Basel as made in Baden? The same goes for Strasbourg. Yes, the bishopric spread far into the east across the Rhine river. However, if this is your line of argument, then large parts of Baden once also belonged to the Habsburg Empire – and wouldn’t that call for the addition of the medals of Roman-German emperors … Hold on, there really are medals of Ferdinand II, Archduke of Tirol, listed in the Further Austria section. Why a medal minted in celebration of the Treaty of Adrianople is listed in said section, is a question that remains unanswered. And is the fact that the Duke of Enghien was captured and taken hostage in Ettenheim reason enough to justify classifying a piece of the Napoleonic medal suite as Baden? There are a few questions that come up when you browse the catalog. Which is really the nature of the beast. Medals are border crossers, some depict themes that are connected to a place, which bears no relation to the dominion of the person in charge. They can be officially or privately commissioned, they can be struck on site, at a remote mint, or even at a far-away private entrepreneur. Which is the exact reason why those who are merely looking to tick of narrowly-defined fields of collection, should not start collecting medals. That being said, let me mention something book lovers will enjoy: the beautiful layout, the exquisite pieces, the detailed descriptions, and the extensive historical comments! It is a numismatic picture book about the history of Baden that offers a cornucopia of historical details. Nevertheless, some aspects could have been improved. Catalogs are not published just to be looked and marveled at, but also to help classify pieces – and coin dealers working on their next catalog don’t have much time to do so. They will have to leaf through the large, heavy and fairly cumbersome book repeatedly as the indices in the book are insufficient. One would have required at least a key of indices in order to be able to immediately find the respective medal. An index of people featured on the medals or the minting authorities would also have been helpful. Well, the author himself describes his book as a declaration of love to medals themselves. And that is a perfect characterization of his work. Every single page reflects the author’s love of these numismatic objects and bespeaks his enthusiasm for their beauty. Who can really blame the author, who is so fond of his topic, for the practical everyday life and logic falling by the wayside occasionally? The book is available on the publishing company’s website. 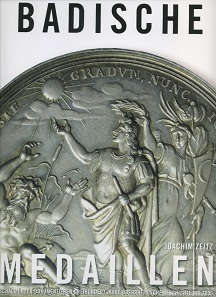 The marvelous book about the medals of Napoleon, published by Joachim and Lisa Zeitz in 2003, is sold out and can only be purchased second-hand.